The picture at the left depicts the three possible endings for the universe. Up until very recently (late 1990's) it was generally accepted that the universe would end in a big crunch. While it was known that the universe was expanding, scientists believed that sooner or later the force of gravity would overtake any other forces and the universe would begin to decelerate. This would eventually lead to a Big Crunch billions of years from now. Whether or not gravity took over was mathematically depicted by the density parameter, Omega (Ω). If Ω was greater than one, then gravity would win as portrayed above in the Big Crunch. However, as scientists began to measure Ω, it began to look like Ω was very close, if not equal to "1" (flat in mathematical terms). Using ground based and balloon based instruments, scientists estimated that Ω was "1" plus or minus 15%. The WMAP satellite confirmed that Ω was one within 0.5%. This meant that the universe would decelerate gradually approaching zero but never get there. 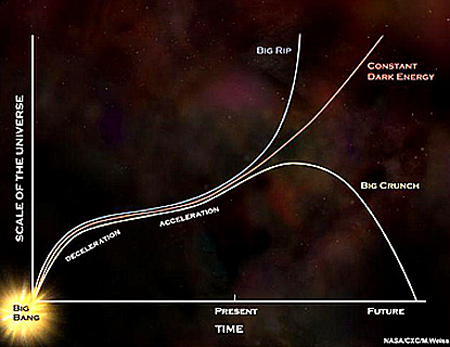 The universe would keep expanding forever but at a snail's pace forever slowing down, but never stopping (depicted by the middle line in the chart). In the late 1990's it was discovered that the universe was in fact expanding at an accelerating rate. This fact threw all previous theories out the window. No one could explain how such a phenomenon could be happening without invoking an unknown force called dark energy. 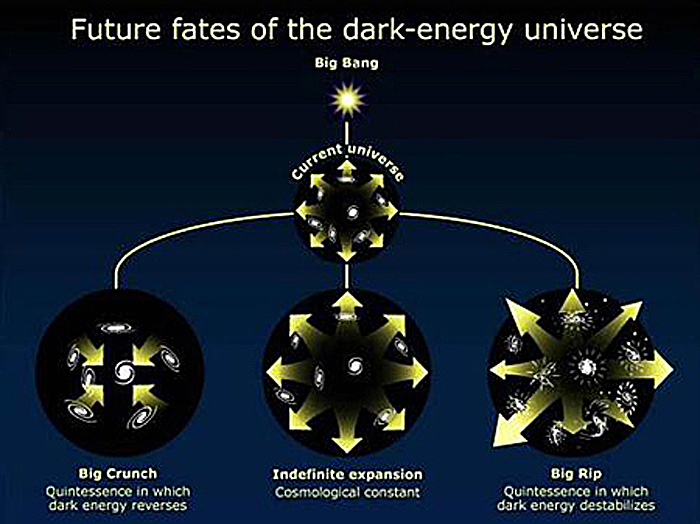 Dark energy is a form of anti-gravity working over large distances that is in the ultimate tug of war with gravity. To this day we have no credible evidence of how this force operates. However, it has been measured ever more accurately and just about all scientists believe there is some type of dark force operating in outer space. This remains one of the great mysteries of our time. If dark energy continues to push indefinitely, the universe will expand faster and faster exponentially until ultimately it rips itself apart. This is now called the Big Rip. Observations of the early universe appear to support the theory that dark energy is a universal, unchanging force. This means that if the dark energy force has not changed over billions of years in the past, it is unlikely to change in the future. So we can expect the universe to continue to expand at an accelerated pace into the future. At some point our galaxy will be alone in space, because all the other galaxies will have traveled beyond the observational horizon and the only light will be from our own galaxy stars. No one knows for sure how the universe will end, but here is a reasonable proposition. Assume that the Lambda Big Bang Model is correct. Also assume that the shape of the universe (mathematically speaking) is the infinite "flat" model (Ω = "1"). Accepting the Lambda Big Bang Model, a flat universe, and the presence of dark energy, then the universe will keep on expanding at an accelerated rate forever, ultimately ending in a cold, dark state. Eventually, all the stars will burn out, leaving stellar-mass objects as remnants, i.e. white dwarfs, neutron stars, and black holes. Subsequently, the stellar remnants (white dwarfs, neutron stars, and other smaller astronomical objects) will themselves be destroyed by proton decay (assuming that proton decay is real), leaving only black holes. Finally, even black holes will disappear due to Hawking Radiation leaving only a diluted gas of photons and leptons. 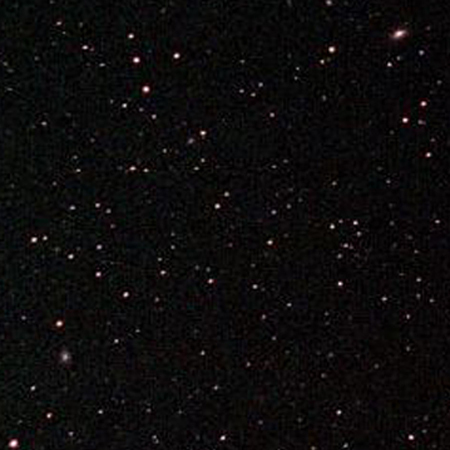 60 million years before the end, the Milky Way begins to fly apart. Three months before the end, planets fly away. Thirty minutes before the end, the earth erupts. One second before the end, atoms and their nuclei break apart.